Okay, this series continues to entertain me much more than I initially expected it to. 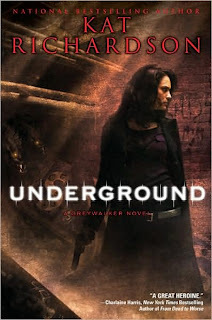 I was so pleased to get a copy of Underground for my birthday and I immediately dived right in. It picks up shortly after the events of Poltergeist and Harper is still dealing both physically and emotionally with the fallout from her ghostbusting stint. Things with tall, blond, and lanky Will are less than stellar and distraction comes in the form of Harper's mysterious friend Quinton who shows up on her doorstep demanding she investigate a rather gruesomely dead body he ran across on the train tracks. It's not the first dead body to be found in a similar state in recent weeks and Harper and Quinton discover up close and personally that it won't be the last either. Together they traipse through the uncanny city underneath Seattle's streets in search of a mythical monster who may or may not be eating the city's homeless and may or may not be controlled by an ancient Native American god. Once again, I simply love the way Kat Richardson describes Harper's Seattle. And this time around she's added Quinton's Seattle--a very different city altogether, populated by the homeless and the dissident, and located entirely underground. I've been wanting more on this particular character and storyline and Underground provides a satisfying amount of info while still saving a few secrets for future installments. Just like Harper, I was sucked into the mysteries behind each underground inhabitant, particularly Quinton and just who he's hiding from and why. This book had a slightly grander feel than its predecessors by nature of the monster they're fighting and I loved the inclusion of Seattle's more unusual history as well as the Native American legend and language. Harper remains a likable, scrappy character who I look forward to following. If you enjoyed Greywalker, make sure you pick this one up. Definitely my favorite Greywalker book thus far. Thanks for the DR link! SEATTLE!!! Okay, okay, I *still* have to pick up her books. Paranormal set in Seattle and the author lives around the corner from me - what am I waiting for? My TBR pile is just too big. Sigh. I also have yet to take the classic tour of the Seattle Underground. *head desk* I just love great local fiction. Grin. Richardson features the classic tour in the book as a matter of fact. I'd love to go on it.